About 6 months ago we had the car taken into the shop for an oil change and tune up and while in there they noticed a small leak from the oil pan gasket. Considering that my car is a 15 year old Crown Victoria, leaks are bound to sprout here and there. However, I hadn't budgeted for the fix that was estimated to be around $600. Now, 6 months later, I had the money to get the car fixed. I hadn't driven it much over the last 6 months so as not to make the situation worse and the cost higher. As insurance I held onto the estimate so that I would get the same price. At the time, I didn't consider that it would be 6 months longer before I took the car back in. First, a call was placed to the repair shop to 1) see if they will take the estimate from six months ago and 2) to schedule an appointment if they did. The first call was answered with a stern "no way do we take them that old." Which I could understand; how do they know how little or more I had driven the car and made the situation worse. However, over the last couple of years we regularly go to this repair shop and have built a good rapport with the owner so we called back when she was working and she was fine with us bringing in the car since the car had only been driven a handful of times over the last 6 months and she honored the estimate. After picking up the car we asked if more damage had been done since the last estimate and she said not much, but the prices had gone up as well. By just keeping that estimate and working with a repair shop that had a good relationship with us saved us a good 300 dollars more. This isn't the first time that saving an estimate has saved us money a few month later while the cash was put aside to cover the cost of the estimate. But this is the first time it has been this great of a savings. 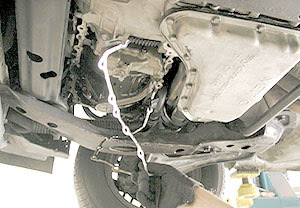 What have been your experiences with saving money on car repair work? This would include both doing it yourself and taking it to a repair shop. Also education about the item helps. you still got "robbed" because a leaking oil pan cant get damaged more by driving it. you can damage the car if you don't watch the oil level (you check the oil every time you add gas like you manual suggests right?) Also the labor and parts for fixing a leaking oil pan have not changed over the past 2 years. Mechanic labor rates has actually went down on average across the country. Honestly, I would ALWAYS get 3 quotes on the work. I don't care how strong of a relationship you have with a place, get quotes to make sure they are in line with other companies pricing. It's the only real way to be frugal with car repairs... but you have to know what is wrong or what to ask for. Frugal with cars means you have to be more educated about them. http://repairpal.com/estimator is also a great place to get a general estimate, then do your calls to find 3 quotes. and THEN decide on where to get the work done. Thank you for the site I will definitely book mark that for other work that would need to be done.